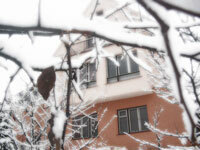 Its snowing over here in Prague, and the Giant Peach (our house) is covered in the stuff. We are all very busy packing and throwing things in a big dumpster outside. New Years Eve was fun. We lit fireworks in the frozen back yard and everyone watched from the top balcony. Nobody got burned (thats for my mum who worries a lot).